We are so excited to have this unique venue on our site. 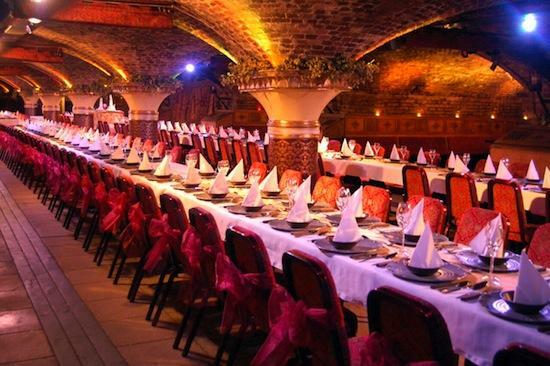 The Ivory Vaults is an exclusive location situated within the historic vaulted cellars of the Grade II listed Ivory House at St Katharine Docks. Nestled between the Tower of London and Tower Bridge, the 10,000 sq ft venue is available for wedding receptions for 100 – 450 guests. And we are not talking just any old wedding reception, we are talking proper full on emersive entertaining ineractive themed wedding receptions. Believe us, they are masters of this! For example their medieval banquet includes 4 courses, medieval show, knights, acrobats...and there are costumes available to hire. As we know, there isn't anything bigger on TV than Game of Thrones right now, and they do a brilliant Thrones wedding! If Medieval or Thrones isn't you thing, they do so many other themes, something is bound to be up your street. Masquerade Balls, Alice in Wonderland..
How much fun does this look?? By the way you don't to go for themed, you could just enjoy the fabulous space in the central London location..and their brilliant wedding team will help you plan your ideal wedding.